Firstly, as I hope came across in my post: Volunteering at the Natural History Museum, I very much love Museums and all that they entail. Secondly, I bear no ill will toward, nor wish to make any assumptions about the people of the institutions mentioned or museums in general, and do not wish to disparage their reputations or intentions, but I am going to be frank and honest about my opinions and so hope they will not be overly offended by them. Thirdly if you feel I have been unfair or am wrong, tell me so and let’s discuss it – that’s why blogs have comment sections, as I am no expert and have the utmost respect for your opinion, especially if more informed than mine. So then, allow me to begin… are you sitting comfortably? This is the image in my minds eye whenever I hear the words “Museum” it’s a very specific image, relating to a natural history setting almost exclusively one that I’m sure many of you will have your own variants on; but is this what a museum is? From my experiences both front-of-house (galleries & expeditions) and back-of-house (curation/research) this can be safely said to be a very bad, out-moded image which factually belongs to the history books… in almost every respect. This image is the “old-world” view of the museum, and it’s very idealistic. This old world way of doing things had many problems, and still does where it is the norm. “new world” museums on the other hand have problems, and I will argue that they have many more than the old… but then I’m a traditionalist so maybe it’s just me? Older museums were run completely by academics and this could often be seen in the content, The curators were academics and decided what people wanted to see and how much information they got; often very little. I remember going to see museums when I was younger where you might be told the chemical formula for a mineral, it’s name and where it was found, but little or nothing besides. This isn’t the way to engage people in the collections you have in your museum, it is nothing less than boring unless you are a scientist and know a lot about the subject, so maybe don’t need the extra information. New museums are at the extreme other end of the scale when it comes to information, they contain galleries often with many fewer objects from the collections, but these objects come with expansive paragraphs of writing. The amount of information given is a definite and drastic improvement over a chemical formula and a name. In terms of content however I have found many museums in recent years are disappointing, because it is clear that the information has not come from an expert, but someone who knows how to teach and entertain, but doesn’t have the detailed knowledge to carry it off. This is a real shame as at the end of the day museums hire curators (or at least they used to) to know about their subject in detail and also to know the collections back-to-front and inside-out. Curators are now in the absurd position where they are by-passed when it comes to writing the information that goes with an exhibit and it’s left to the outreach staff. These outreach staff are often fantastically good at their jobs because they are hired specifically for the role and trained as teachers or educators in the first instance, but they seem to be afraid to ask the experts for input to their work… I don’t know why and have no theories, but its result is information in exhibits that often leaves out vital and fascinating scientific facts in favour of idealistic, unprovable or plain wrong interpretations. Curators are now in the firing line at some institutions because of this lack of input through no fault of their own. Museums have cottoned on to the fact that while they pay a certain amount of money for a curator who is both good at collections management and an expert in their subject, or pay less for someone who is only good at the former and whose time will not be split with research and academia, and in this time of austerity who can blame them? …Well me actually, whilst trying to save money is almost always admirable, in this case it is severely short sighted; and here’s why. Anyone who wants to access the collections will have to work doubly hard because the collections manager will be little able to help them beyond telling them exactly where specimen X is. The Museum’s collection may be categorised fully (in some cases for the first time ever) but it just becomes a storehouse, and museums cease to be the places of cutting edge research, learning and fascination that they once were… in effect they lose their soul. Speaking of collections, let’s briefly cover something else. Has anyone else noticed how few actual specimens are on display in many big museums, there’s loads of “interactives”, videos and interpretative text, but there seems to have been a severe decline in the number of objects on display. 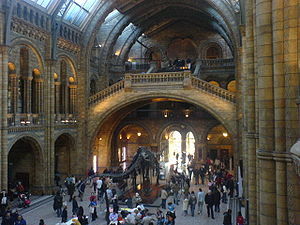 To use but one example; When I visited the Natural History Museum in London as a child, I have fond and awe inspiring memories of the Mammalian Megafauna gallery (to the right of the doors as you walk in) at some point between then and the next visit (2008) this was removed wholesale and replaced. Not with an updated exhibit, not with more objects of a different type, but with a very “@Bristol” type exhibit about ecology without a single specimen and with a massive expansion of the museum shop (it now takes up half the ex-gallery). These massive, awesome fossil remains & casts have been put into storage and are now unavailable for public viewing. When the Palaeontology department alone has over 9 million objects, most of which are not on display, to say this is lamentable has to my mind a good change of being understatement of the year. All this alongside the BBC/British Museum extravaganza “A History of the World in 100 objects”, which has already showcased many more than 100, and is all about getting the experts in to talk about them, and let the public SEE them. At least someone’s got the right idea! If you asked me, or I suspect most people, we go to museums to see objects of fascination; not to stare at well meaning computer screens and animations. I could go on as there are other problems such as over rationalisation, the (muted) abolition of free entry at national museums, the mothballing of historically/scientifically important collections etc. but I think I would be labouring my point. Perhaps I’m wrong, perhaps I’m too old-fashioned and traditionalist but I think we need to put educators back in touch with curators, bring back the objects (but not lose the information), ease up on the unnecessary overuse of interactives and above all give our many, beautiful museums back their souls. This entry was posted in Education, Science and tagged curation, Curator, Education, exploration, Museum, Natural History, Natural History Museum, Science, teachers, teaching on December 10, 2010 by Benjamin Brooks. from some like minded people who are in the position to have an impact on the situation. Who Knows?